The exhaust system is one of the first and easiest things to consider with a rotary powered car to increase power. The design of an exhaust system must include several considerations including emissions requirements, exhaust flow, exhaust note, and overall quality. With that said, there are many options that go across the board from emissions friendly to full race setup. However, RotorSports Racing only endorses the claims of the manufacturer with respect to emissions and power gains. We are a race shop and do not have emissions testing equipment available for testing. From bolt-on manufactured exhaust systems to complete custom designed applications, a good exhaust system is a key component to unlocking the performance of your rotary engine. Downpipes replace the pre-catalytic converter to improve exhaust flow, improve turbo spool up, and lower engine bay heat. Made from 3" mandrel bent stainless steel, all downpipes are bolt on design and connect the stock turbos to the stock main catalytic converter, or stock location performance main catalytic converter. This is categorized as a race only product and does not guarantee emissions compliance. Additional services include ceramic coating of downpipes to control heat distribution. Heat contained within the turbo system will increase power, while heat escaping to the engine bay will raise intake temps and reduce power. For race use only. Removing the converter restrictions on the exhaust significantly improves power and reduces stress on engine and turbos. A midpipe can replace the main catalytic converter and further improve performance. It connects from the stock precat or downpipe to the stock location cat-back exhaust. Note: Installing a midpipe will significantly increase the sound level of the exhaust. Unlike other aftermarket catalytic converters, the B�nez unit uses a stainless steel mesh suspension element that surrounds the large, high flowing converter brick. This suspension element is built to withstand extreme termperature demands, and provide many miles of dependable performance. The case is also constructed of stainless steel for better durability, and incorporates a unique design which causes the inlet exhaust gases to spread evenly over the brick for better flow, improved efficiency, longer life, and reduced noise. This item fits between your stock precat or performance downpipe and will bolt directly to the stock catback system or any other aftermarket catback system. The B�nez kit also is much lighter than the stock unit it replaces and noise levels are only slightly increased. Please also note that the oxygen supply tube from the air pump is still retained, making this system 100% bolt on. The B�nez Performance Converter System is an excellent option for those seeking a street legal system that provides improved performance, better gas mileage, and less stress on the engine and turbos. This kit replaces both of the stock catalytic converters with a smooth, mandrel bent racing downpipe and a center section which utilizes one of our unique, 3" high flow converters. This combination gives you the most power possible within consideration of emissions requirements. This kit is completely bolt up and replaces everything from the turbos back to the stock or aftermarket cat-back exhaust. The oxygen supply tube is also retained. If you want a quality built, great flowing exhaust without the loud raspy exhaust sound, consider this system as one of the best and most popular among enthusiasts. 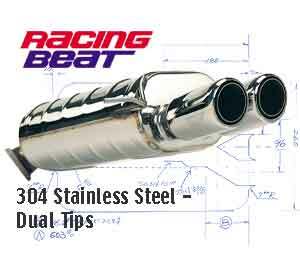 Every Racing Beat 304-Series Stainless Steel RX-7 Exhaust System is designed by Racing Beat to maximize performance while maintaining a deep and mellow exhaust note. Each Racing Beat system is designed as a bolt-on system and utilizes all existing brackets and hangers and comes complete with all mounting hardware and gaskets. The straight-thru design of this exhaust system has been designed to offer your RX-7 maximum turbo performance with a 12-13 horsepower gain! All of these cat-back systems are emissions legal and meet the strict noise limits imposed by many law enforcement agencies. Normal driving produces a mellow deep tone, but jump on the throttle and these systems come alive with an even deeper, throaty sound. The heart of every Racing Beat exhaust system starts with the muffler canister. High temperature, compressed sound insulation is wrapped around the core of every muffler canister to provide superior noise suppression. While some manufacturers utilize small packing-peanut style insulation pieces in their canisters, these small strands of insulation material may compress and blowout far quicker than stranded material found in the premium systems. Single Tip: This 3-inch system is offered for the 1993-95 RX-7, and is designed with a polished, 4-inch tip. This tip features a 70-degree angle cut with a rolled edge and a unique internal core pipe. This beautiful tip is finished with an embossed RB logo. Dual Tip: This 3-inch OD system is offered for the 1993-95 RX-7, and is designed with polished, dual 3-inch tips. These tips feature a 70-degree angle cut with a rolled edge and a unique internal core pipe. These beautiful tips are finished with the RB logo embossed on each tip. Built for racing. This system is designed for optimal flow and minimal muffling. Piping Diameter 70mm-85mm. Tip 115mm. Built for racing. Dual tip design. This system is designed for optimal flow and minimal muffling. 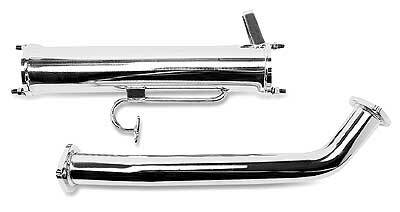 GReddy styling polished stainless muffler with 4" tip. Large canister for noise suppression. Offset tip design for better ground clearance. 2nd Generation RX-7 From bolt-on manufactured exhaust systems to complete custom designed applications, a good exhaust system is a key component to unlocking the performance of your rotary engine. Performance tests on a Dyno Jet chassis dyno have shown a 5-7 HP gain over the stock system. This bolt-on system uses the stock mounting points for ease of installation. Each system is supplied with all necessary mounting hardware and gaskets. These components are also available separately. This is the ultimate exhaust for any Turbo II RX-7! Let your turbo breathe to it�s full potential with Racing Beat's �turbo-back� complete exhaust system. The Turbo II High Performance Exhaust system incorporates a 3.15-inch (80mm) down pipe from the turbo outlet that mates to a presilencer section. From the head of the Y-pipe two 2.375-inch (60mm) pipes extend to the ceramic wool-packed 409-stainless steel rear main mufflers. 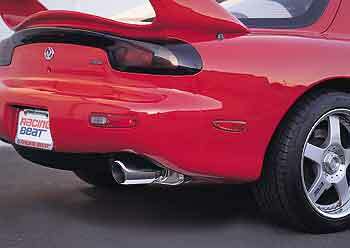 The bolt-on exhaust system increases horsepower approximately 32% - a 59 HP increase on a 1987 Turbo II RX-7! The Turbo II High Performance Exhaust system reduces exhaust gas back pressure significantly, thereby allowing the un-assisted turbo boost pressure to increase to 10-11 psi. A Fuel Cut Controller (part No. 11570 or 11571) is required to prevent fuel cutoff to the rear rotor above the factory pre-set limit. Each system is supplied with all necessary mounting hardware and gaskets (does not include turbo outlet gasket). The down pipe section is provided with a position for the oxygen sensor. We also offer individually the components comprising the Turbo II Complete High Performance Exhaust system for those individuals wishing to build custom exhaust systems for their specialized applications. This 3.15-inch (80mm) down pipe is a direct replacement for the down pipe in the Racing Beat Complete TURBO II Exhaust System. This down pipe is intended as a bolt-on component ONLY if used with the Complete Exhaust System components. Supplied with a 3.15-inch (80mm) outlet flange, this down pipe can also be used for as the �lead� component in a custom exhaust application. Gaskets are NOT supplied but can be purchased separately. 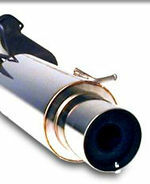 The TURBO II Replacement Pipe/Pre-silencer combination incorporates a 2.5-inch 0.D. Down Pipe and a perforated stainless steel core and stainless steel wool-packed Power Pulse Presilencer to boost power approximately 14% - a 26 horsepower increase on a 1987 Turbo II - and maintain a comfortable exhaust noise level during full power driving. The replacement pipe connects to the turbo outlet flange and eliminates the catalytic converter, while the presilencer connects to the factory y-pipe for a complete bolt-on system. A mounting position for the oxygen sensor is provided in the replacement pipe. The replacement pipe reduces exhaust gas back pressure, resulting in a turbo boost increase of 1-2 psi, without the use of an external boost controller. A Fuel Cut Controller is recommended to prevent fuel cutoff to the rear rotor (Part No. 11570 or 11571). This kit contains mounting hardware, a split air cover plate, and gaskets. 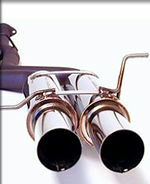 Down Pipe available separately for $90 for those building custom exhaust systems. Both muffler canisters are finished with newly re-designed 3-inch, polished 304 stainless tips for an aggressive look. Performance tests on a Dyno Jet chassis dyno have shown a 5-7 HP gain over the stock system. This bolt-on system uses the stock mounting points for ease of installation. Each system is supplied with all necessary mounting hardware and gaskets. Components available separately. The 1986-92 13B 6-port engines, in stock form with the factory fuel injection, produces similar power gains with either the Header/Presilencer combo or the Cat Replacement Pipe/Presilencer combination. If you have no intentions of installing any other aftermarket carb set-up, we recommend the use of the Cat Replacement pipe/Presilencer combo since it offers a slightly quieter exhaust note, is easier to install and less costly. If you are intending to upgrade the intake or fuel injection system, the Header/Presilencer combo offers the greatest performance potential. The Replacement Pipe/Presilencer combination incorporates a 2.5-inch O.D. Down Pipe and our perforated stainless steel core and stainless steel wool-packed Presilencer to boost power approximately 13% - an 18 horsepower increase on a 1987 RX 7- and maintain a comfortable exhaust noise level during full power driving. The replacement pipe connects to the factory exhaust manifold, and the presilencer connects to the factory Y-pipe, replacing all catalytic converters and intermediate tubing. It is not possible to use just the down pipe to replace only the catalytic converters. The use of the presilencer is required to complete the connection to the y-pipe. Or a short length of tubing can be substituted in place of the presilencer (not offered by Racing Beat), but do not suggest this for street applications due to the unacceptable increase in exhaust noise. The down pipe is equipped with an exhaust back-pressure tube for correct operation of the 6-port actuators. Installation of this requires the removal of the air control and check valve and the air pump. This kit includes all necessary mounting hardware, air control & check valve cover plate, and gaskets (Back Pressure Pick-up and Replacement Pipe-to-Presilencer gasket only). If the exhaust manifold outlet or Y-pipe gaskets are needed, refer to the �Exhaust Gaskets� section of the site for suitable replacements. For optimum performance gains for this application, we recommend that a header be used on an engine configured with a carburetor intake system. For this reason, we suggest another suitable configuration for use on a fuel-injected engine like the Racing Beat Catalytic Converter Replacement Pipe with Presilencer combo. These components offer comparable performance gains, quieter performance and a price advantage as compared with the header/presilencer combination. These components replace only the stock exhaust components located between the stock exhaust manifold and the Y-pipe. The Header/Collector assembly is constructed with .125-inch wall, mandrel-bend, mild steel tubing for increased durability. Both flanges are flame-cut from .4375-inch thick steel plate for positive gas sealing. An outlet gasket is included. Engine-to-header gaskets not included. *Legal in California only for racing vehicles, which may never be used upon a highway. (All applications except Mazda Factory Race Peripheral Rotor Housings) Racing Beat's Road Racing Header is the first step in building a serious racing exhaust system. The engine-to-pipe flange is flame cut from 2-inch thick flat steel. Like all of the headers manufactured by Racing Beat, the Road Racing Header is constructed with 2-inch O.D. mild steel tubing, .125-inch inch wall thickness, and mandrel-bends throughout. Outlet flange gaskets, bolts, and nuts are included. Engine-to-pipe gaskets are not included, but are available separately. An Air Control and Check Valve Cover Plate is required when using this header with a stock intake system. The Road Race Header can also be used as the basis for a custom streetable exhaust system in any car from 1971-92 (equipped with a 6-port engine) which allows simple swapping between street and race exhaust systems. These headers can used with the Street Port Center-Section Pipe (1979-85 12A & 13B except GSL-SE - Part No 16398) or (84-85 GSL-SE - Part No. 16399). (Mazda Factory Race Peripheral Rotor Housings) This Road Racing Header Front Section is intended for use with Mazda Factory Race Peripheral Intake Port Rotor Housings only. This housing has a different stud pattern for the exhaust. This header is not intended for use on Racing Beat manufactured 13B Peripheral Intake Port Rotor Housings, which have the stock stud pattern. Engine-to-pipe flanges are welded to 2-inch O.D., .125-inch wall thickness, mandrel bend mild steel tubing. Outlet flange gaskets, bolts and nuts are included. High flow exhaust system with full stainless steel construction. Built-In Presilencer. Single sided outlet. Comes with bolt-in silencer for street use. Made for racing. Minimal bends with increasing diameter piping for highest exhaust flow. System includes a presilencer to mellow the tone a bit. Please note, this system is designed for max power and uses a single sided exhaust outlet. 1st Generation RX-7 Call for details. More info coming. 3-rotor projects have custom built exhaust systems. Call for details. This engine-to-header can be used to fabricate a custom exhaust system for a 20B engine. Uses two (2) gaskets (16309).